I met Arnold Gay once a long time ago. I was still working at MediaCorp and he was the hunky Channel NewsAsia news reader. It was Lisa Ang who introduced me to Gay, though I can’t remember who introduced me to Lisa Ang. Ang was a Channel NewsAsia host at the time but had previously hosted the Channel 5 infotainment series Hey Singapore and played VR Man’s tomboy girlfriend. What struck me about him was that he seemed like a remarkably well-adjusted guy for someone whose surname is the equivalent to being born with a “Kick me” sign permanently pasted on his back. So he’s the last person I expect to be in the centre of a controversy. Before this month, possibly the most controversial thing he did was burn his bridges at MediaCorp by jumping ship to join the newly formed (and now defunct) SPH MediaWorks in 2000 (which I did too). Then two Saturdays ago, he burned something else. 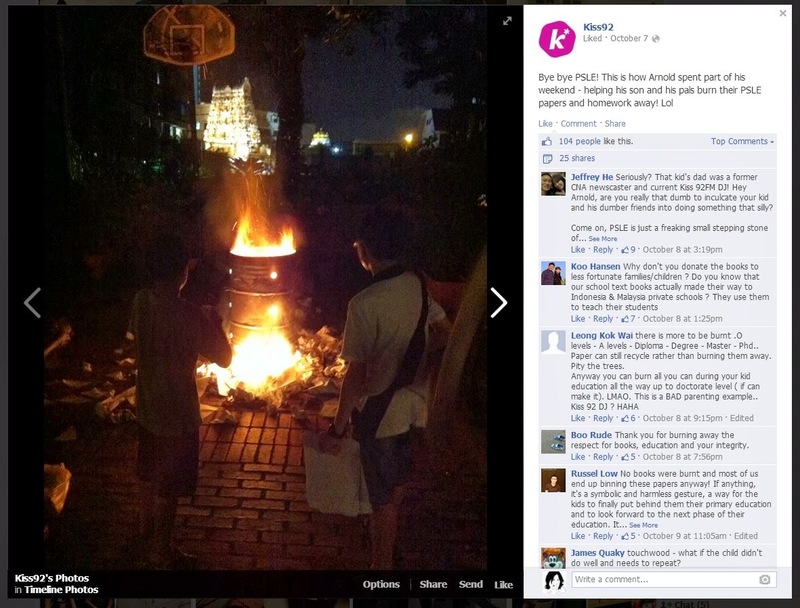 On Oct 5, Gay, now a Kiss92 radio DJ, reenacted his own mini Singaporean version of Fahrenheit 451 by gathering his 12-year-old son, his son’s friends and his friends’ children to throw their schoolwork into a bonfire to celebrate the end of the reviled Primary School Leaving Exams (PSLE). 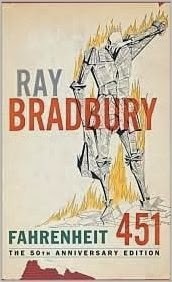 I’ve never read the Ray Bradbury novel Fahrenheit 451 about book-burning or seen the movie. But I have seen the movie Fahrenheit 9/11 by Michael Moore and that’s close enough. After Kiss92 posted a picture of Gay’s flaming stunt on its Facebook page, Gay got flamed himself for such inflammatory behaviour. Uh… if Gay manages to raise a kid who can get a PhD, then I think it’s fair to say Gay is not “really that dumb”. And the National Library was already destroyed to make way for a road. The new one is the “National Library” only in name, not in my heart. Although I'm against polluting our continually haze-threatened skies with more ash, I have come to accept that burning stuff in public is a Singaporean Chinese way of life. 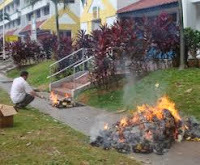 Since we are already burning fake money, paper iPads and paper houses for the dead, we might as well burn some assessment books to help the dead score in their PSLE so that they can get into the secondary school of their choice in hell. Heaven forbid they end up in a neighbourhood hell school. That would be hell indeed. 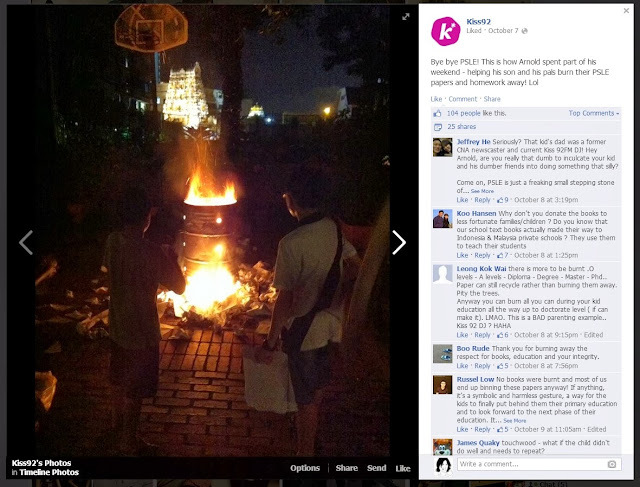 I just hope this post-PSLE burning thing won't become an annual islandwide ritual. My family suffer enough breathing problems during the Hungry Ghost month. Still, as a parent, I empathise with Gay for wanting to provide a catharsis for his son and maybe himself after the stress of the PSLE. Being a father of two teenagers, I am constantly on the lookout for opportunities to bond with my kids. When they come home from school, the first thing they do is interact with their mobile devices rather than another member of the family. 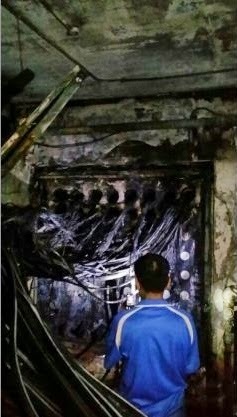 So a blessing in disguise of sorts was the disruption in Internet services caused by a fire at a SingTel facility in Bukit Panjang last Wednesday. Deprived of a broadband connection for two days at our Choa Chu Kang home, instead of staring at the computer monitors or our smartphones, my kids, my wife and I were forced to stare at each other. That was as close as we got to bonding in my family. We didn’t have anything to burn. My son's O-level exams only start later this month. I’m not sure whether she meant that as a good thing or a bad thing. I suspect mine was not the only family forced to bond because of the Internet disruption. Wait a minute. I just realised something. A mysterious fire caused last week’s Internet disruption which might have led to a sudden surge in family bonding in Singapore. Hmmm… who do we know has recently started a fire to bond with a family member? I wonder, were any charred remains of past years’ PSLE papers found at the burnt SingTel facility? I think it’s about time Gay come out – with the truth. I bet Lisa Ang can make him talk.